Early-childhood clinicians such as pediatricians and child psychologists are often the first to raise the alarm for families with children who exhibit developmental disorders, such as fetal alcohol spectrum disorder (FASD). But pediatricians usually aren’t specialists, and the hallmarks of FASD can be subtle. A new tool developed by neuropsychologists at San Diego State University could make it easier for doctors to recognize signs that might indicate an FASD diagnosis and recommend more precise screening. The disease once commonly known as fetal alcohol syndrome is now recognized as a spectrum disorder, with a wide range of physical and neurobehavioral symptoms. It is caused by a mother’s prenatal alcohol exposure, although there is no consensus on just how much exposure to alcohol represents a critical risk. Some recent studies suggest that between about one and five percent of all children born in the United States fall somewhere on the disorder’s spectrum, making it the most common preventable cause of intellectual disability in the country. One of the most telling hallmarks of the disorder is a constellation of facial features, including a smooth upper lip, a thin border between the lip and facial skin, and a relatively small head. But not every child with FASD presents these physical markers. The condition’s other effects—slowed body growth and intellectual disability—are harder to spot in very young children. “The risk is that without the facial features commonly associated with FASD, we can miss the signs of prenatal alcohol exposure in children,” said the study’s lead investigator, SDSU neuropsychologist Sarah Mattson. Early identification of the disorder can prove critical, she added. There’s no cure for FASD, but timely interventions can help parents and children with the disorder learn behavioral strategies to improve their quality of life. 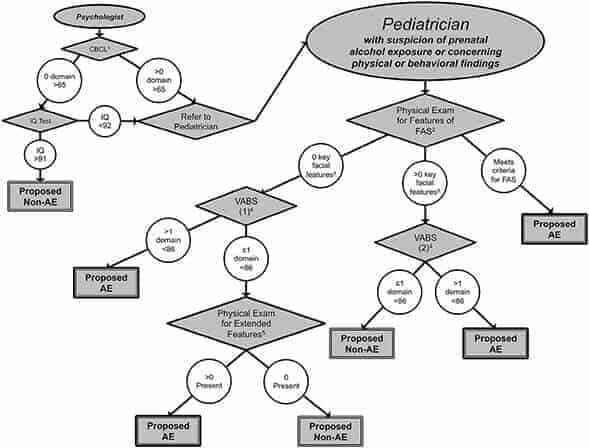 To help clinicians identify children who might have FASD but lack the telltale physical features, Mattson and her colleagues developed a “decision tree” diagnostic tool. The tool is based on behavior ratings, IQ testing and physical measurements from 434 children. Some of these children were known to have been exposed to alcohol prenatally; others had no prenatal alcohol exposure but expressed a range of behavioral issues including ADHD. With funding from the National Institute on Alcohol Abuse and Alcoholism, the researchers sorted through thousands of variables and narrowed them down to a shortlist of meaningful indicators, then organized them into an if-then decision tree. Using this tool, pediatricians or psychologists can start with a child behavior checklist and an IQ test. If children meet certain threshold scores on these tests, they move onto a different behavioral test, followed by a more extensive examination for physical features. Depending on the scores for these various tests, the tool either recommends or doesn’t recommend further evaluation for prenatal alcohol exposure. As a final part of the study, which was recently published in the Journal of Pediatrics, Mattson and colleagues tested the tool with 454 children. Using the decision tree, then following up with children who were recommended for further alcohol exposure testing, the researchers reported their tool correctly identified about 85 percent of alcohol-exposed children, surpassing their expectations. Eventually, the researchers plan to develop an app-based version of the decision tree. Mattson hopes that the app and further testing in clinical settings will help refine the tool and make it even more useful to clinicians.